On July 29, 2015, adult education students from the PathWays PA and the Delaware County Literacy Council (DCLC) celebrated earning their GEDs at a joint ceremony. The moving ceremony began with Laila Hill, an accomplished singer, sharing her rendition of the Star-Spangled Banner. Brenda Dawson, president and CEO of PathWays PA, gave the welcome and introduction. The GED test gives students of all ages the chance to move ahead with their educational attainment. In Delaware County, 6% of adults ages 25-64 do not have a high school education. Beginning October 1, 2016, students applying for financial aid for higher education will be able to use a new, easier process being proposed today. Traditionally, students preparing for college or graduate school must fill out the Free Application for Federal Student Aid, or FAFSA, to qualify for federal grants and loans. The FAFSA application window runs from January 1 to June 30 for the upcoming school year, so if you were going to school in September 2015, you sent in a FAFSA sometime before June 30, 2015. While the application has become easier in recent years, it still takes time and persistence. Even once the FAFSA is filed, students must sometimes wait until their taxes - and their parents taxes - are filed for the paperwork to be processed. By the time students receive their financial aid packages, they have already applied to colleges and may have even made a decision on where to go without knowing how much funding they will have. Join USDA, FRAC and Robert Wood Johnson to learn how you can create healthier child care environments with the newly released Spanish language version of USDA's "Nutrition and Wellness Tips for Young Children: Provider Handbook for the Child and Adult Care Food Program," and other Spanish language resources, including the Look and Cook Recipe Cards and the Two Bite Club. Build a healthy plate with fruits, vegetables, whole grains, and beans,Encourage physical activity and active play,Keep food safe and more! This is an opportunity to learn and ask questions. Sequestration is almost here.... again. A temporary agreement kept those cuts from taking place, but that package (the "Murray-Ryan" deal) expires in fiscal year 2016 - aka October 1, 2015. If Congress doesn’t take action, disastrous budget cuts to our nation’s most critical programs—including early education, veterans’ care, law enforcement, women’s health, and more-- will go back into effect, causing pain to millions of Americans across the country. Interested in PathWays PA posts on similar topics? 1/29/15 - Pennsylvania Extends Streak of Lackluster Performance for Financial Security of its Residents11/10/14 - Join Us in Building Assets in Pennsylvania!5/30/13 - The Payday Lenders Are Swarming. It's Time to Act. 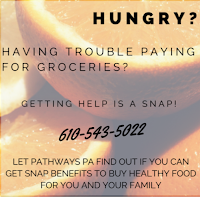 Did you know that PathWays PA provides SNAP application assistance? Our SNAP Benefits Specialist can assist you in accessing SNAP and other workforce supports to help you make ends meet while you're between jobs and provide assistance to ensure you remain employed and are able to move toward self-sufficiency. To participate in an eligibility screening for SNAP benefits and other workforce supports contact Lauren Rodino at (610) 543-5022. Many students are starting back to school this week. While some are anticipating meeting their new teachers and reconnecting with their friends to share stories of their summer, there are thousands of homeless teen girls wondering where they where they are going to sleep tonight, and whether they will be able to attend school at all. PathWays PA's Basic Center Program provides emergency shelter services to help runaway and homeless teen girls between the ages of 13 and 17 years old with assistance stabilizing their lives, remaining engaged in school, and successfully returning home (when safe to do so) or transitioning to safe, permanent independent housing. For more information about the Basic Center Program please contact LaSheena at 215-397-4287.